There is no pairing more dynamic than kids and their pets. Try and remember the fascination you felt towards animals as a child. Dogs, cats, rabbits, guinea pigs and even lizards, all represent to children something joyous and completely magical. It’s fair to say, that most children feel a special connection to the animal world, and the domesticated segment of that world consisting primarily of dogs, cats and the like, tends to enthusiastically reciprocate. If we are lucky enough to have them in our households, animals are the perfect complements of childhoods. Sadly, many families living in urban environments simply cannot fulfill their kid’s puppy dreams due to perfectly necessary, practical considerations, but those who can, have a lot to think about and much to consider before taking the leap into pet ownership. Many of us go through life never giving pets a second thought, until we have children, and then we notice them getting that pathetic, longing look in their eyes every time a stranger walks by with a four legged friend. It’s all we can do to stop them from leaping at the unsuspecting animal in a frenzy of tender feelings, suffocating it with hugs, punchy kisses and loud coos. There is nothing quite as compelling as the faces of our sweet babies tugging at our clothes and heartstrings, while they beg for a puppy or a kitten or whatever other kind of critter they’ve got their hearts set on. But let’s review the implications of acquiring for our kids, the most common of animal companions, a dog. Deciding to get a dog for your kids is equally as wonderful as it is laborious and potentially fraught with complications. There is an extensive list of positives to mull over. Besides transforming into a bona-fide mom/dad hero to your kids, the rewards of childhood pet ownership extend unexpectedly far. • Activity level in children with pets is considerably higher, contributing to their meeting and even exceeding daily exercise quota, which in turn reduces the risks of childhood obesity and diabetes. Experts report that children who own pets require less visits to the doctor. • Young readers can hone their reading skills by reading to their pets! • Caring for a pet teaches children about responsibility and helps develop their nurturing side, this can be especially beneficial to boys, who do not usually get to experience themselves as caregivers during their formative years. • Pets help foster personal growth by advancing the kids’ sense of respect for life and nature. 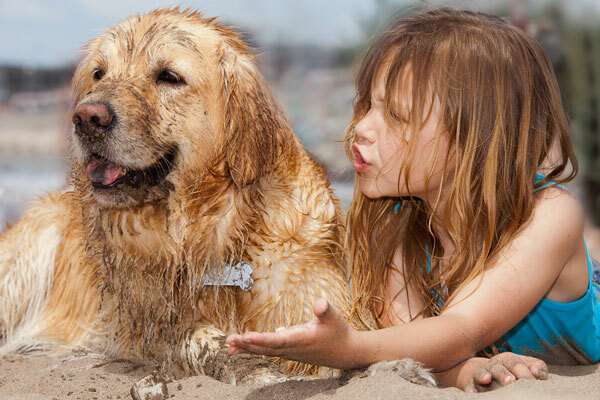 • Children with pets are better adjusted, more confident and exhibit greater impulse control. • Pet ownership contributes to children developing great sense of empathy and compassion. With all that being said and for all the pros listed above there are still some definite potential cons. It is important to do your research. For example the kind of dog that would be best suited to your family is something to examine first and foremost. Consider your kids’ age, size and your family’s overall life style against the dog’s size, temperament and energy level. Experts say that the ideal dog should have an energy level just below your family’s. Additionally some breeds are better with kids than other, some are better with kids of certain ages, and, in the end, every individual dog has its own list of qualifications that should be carefully. • One of the most disheartening things that can happen is that upon bringing your new furry family member into the house, you discover that one of its human residents suffers from an animal allergy. An unexpected pet allergy situation can really cause a kind of tragedy in your child’s life, as it is unlikely that you will be able to find a solution besides removing your new pet from the home. Taking care to test your children (and spouse) to make sure they are not allergic is very important. • Remember, that even though the kids make fervent promises to you, swearing they will take care of their new pet, it’s very likely that they will fall short of their vows, leaving you to have to do much of the heavy lifting. Make sure you and/or your spouse have the time and energy to take care of the animal’s needs, or it and its effects on your home can become quite unmanageable. One last thing worth mentioning is that to young children, everything seems relatively simple, parents tend to fulfill their needs and desires rather seamlessly and thus their expectations of us and of life can be pretty high. Pets, though magical and wondrous in the eyes of children, actually represent to their parents a hassle of the highest order. Even though children are the ones who want them and love them most, let’s be real, the burden of their care falls mostly and squarely onto the shoulders of, already overextended, under-slept parents. So while you are pondering giving the gift of pets to your children, please take time to consider how this action will affect your life. It is important, that we, as parents, are truly prepared for the arrival of pets into our households, as we are the guardians of our family life. Consider yourself, because in the end your happiness is a crucial component of your kid’s happiness. There is no shame in admitting that for whatever reason the pet is not a manageable proposition. Sometimes, doing what’s right for your family is about knowing your limitations and saying “No”, in order to preserve family balance and our own sanity.